The Galapagos Islands are located 600 miles west of Ecuador, and therefore the only way to arrive there is by plane which leaves from Quito and/or Guayaquil on Ecuador's mainland. There are two airlines flying to the islands, TAME and AEROGAL, both with regular daily flights with departures from 7:00 am to 9:30 am, this means that you must spend at least one night in any of the mainland hotels when you first arrive to Ecuador as well as on your way home. There is a wide range of accomodations from budget to four-star, and we can arange both flight reservations as well as hotel bookings, please check our Ecuador Hotels section for more details on accomodations. Day 1: Very early in the morning, one of our mainland guides will pick you up at your hotel and take you to the airport to catch your flight to the Galapagos, we always will try to make your reservation on the first flight leaving at around 7:30 am which arrives at 9:30 am on Baltra Island so that you can make the most out of your day in the Galapagos. Once you arrive to the airport you will have to clear the National Park "customs" and pay an entrance fee of $100 USD for adults, or $50 USD for children under 12. Once outside, our guide will be waiting for you to take you to you hotel accomodations. Please check out Galapgos Hotels section for more information on accomodations on the islands. Day 2: At approximately 6:00 am we will be on our way to the eastern side of the Galapagos which is known as one of the best fishing areas in the archipelago, you can expect to catch Striped, Blue, and Black marlin, depending on the season, however since the water temperature in the Galapagos is pretty much constant all year around you can find bill-fish pretty much every month of the year. 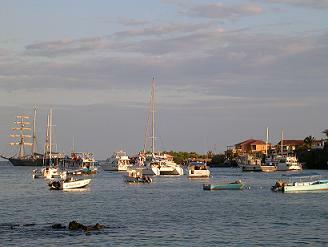 After our Galapagos fishing day we will be on our way to Puerto Ayora, the largest town and comercial center of the Galapagos. You will spend the night in one of the nicests hotels in town. Day 3: Early morning departure to the southern side of the Galapagos for another fishing day, this time of course besides looking for bill-fish you can expect to catch Tuna, Wahoo and Jacks. Afternoon return to town and back to the hotel. Day 4: If you only have time to spend 4 days in total in the Galapagos this day we will take you on an early morning excursion which can either be a visit to the Charles Darwin Research Center or a visit to the highlands of Santa Cruz, after this we continue to Baltra airport in private transportation in time to take the flight back to the mainland, departing aproximately at 12:00 pm and arriving to Quito at 16:30 pm, schedules may vary. If you would like to stay an extra day we will take you fishing on day 4 and day 5 will be the above plan.